The transport belt is the easiest and cheapest method of automatic item transportation. It is the first tier among the three transport belts. No prior research is required and it is available from the beginning of the game. 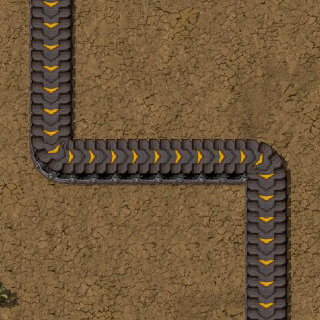 3 fast inserters per side will fill a basic transport belt to maximum density. Increased throughput from 13.33 to 15. Consistently holds 8 items per tile.